It is impossible to overstate the importance of Myanmar's jade industry to the country. But it is almost as difficult to pin down the sector's value with any degree of precision. A 2015 report, from Global Witness estimated the total value of the jade industry in 2014 to between USD 5 billion and USD 31 billion. The higher estimate was roughly equal to 50 percent of the country's GDP at the time. 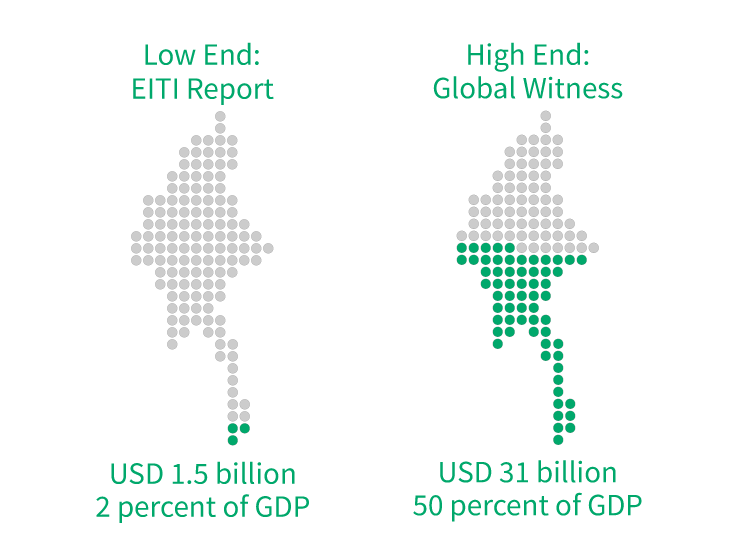 These figures are at odds with Myanmar's first EITI (Extractive Industries Transparency Initiative) report, also released in 2015. It stated USD 1.5 billion of jade was sold at official emporiums in 2014. There have also been other attempts to estimate the total value of Myanmar's jade industry. In 2013, a collaborative research project between Harvard University's Ash Center and Myanmar social enterprise Proximity Designs estimated the value to be USD 8 billion a year. Another study by the same two organizations in 2016 estimated the value to be USD 15 billion. These figures underscore the opacity of the total value of Myanmar's jade industry. Clear and definitive sector data is very hard to find. Most estimates rely on a lot of assumptions. Much of the discrepancy stems from the fact that a significant amount of mined jade is never reported to the government. Estimating prices and quantities produced when significant amounts of jade leave the country illicitly is difficult. 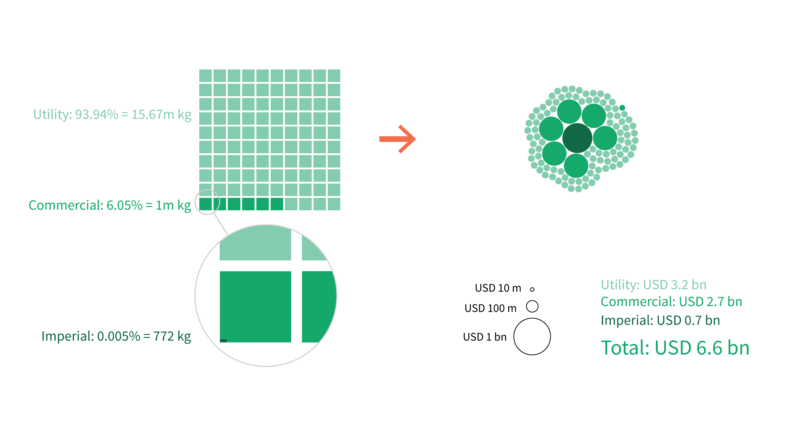 This analysis aims to visually demonstrate how such estimates are calculated. We replicate the method used by Global Witness to estimate the total value of jade produced in 2014, proceeding step by step in order to understand what the data tells us and what is unclear. There is two extra years' worth of additional data, as well as more detailed information made available by the Myanmar Gems Enterprise (MGE). If we can find out how much jade was produced, and what price it was sold at, we can calculate its value. But it gets complicated. All jade is not created equal. There are three jade types. Some are much more valuable than others. As for the quantity produced, we only have data on the total amount of jade produced. There is no breakdown of how much is produced by type. Moreover, we only know the prices of stones sold at official government gems and jade emporiums. These only account for a small fraction of the total jade produced each year. 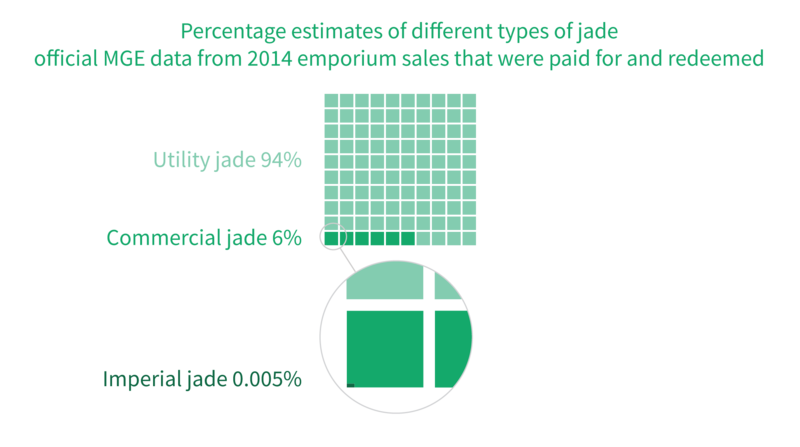 In addition to all these uncertainties, the quantities, prices and value of the jade sector also fluctuate significantly from year to year. We began by looking at Global Witness' highest estimate: USD 31 billion of total jade produced in 2014. At first glance, this estimate might seem comparable to the sector's value in other years too. This isn't necessarily the case. First, let's look at how the total quantity of jade produced varies from year to year. Myanmar's Central Statistical Office compiles the data on total volume (the same data that Global Witness used in their calculations). We can see that 2014 marks the lowest quantity produced in about a decade. Next, let's look at how the prices fluctuate. We don't have the average prices for the sector as a whole, but we do have the average price of uncut/unprocessed jade exported to China from U.N. trade statistics. Prices of jade exports climbed steeply in 2013 and 2014, but came crashing down in 2015. Finally, let's look at the total value of exports to China. Since we cannot directly see the total value of the whole sector, the next best thing is to see how much of it is officially exported to the largest market. In 2014, the total value of jade exports to China increased tenfold from the previous year, and quickly decreased by a similar amount in the year after. This goes to show that 2014 is a pretty atypical year for the jade sector. Therefore, whatever methods we use to estimate the value of jade produced in that year, we can safely assume that the total value for other years will be significantly lower. With that in mind, we go back to our calculations of the value of the jade sector in 2014. But before we dive into the numbers, we need context: what are the types of jade and how is jade officially sold? What are the types of jade? Commodities such as gold or oil have prices per unit that are more or less standardized. Each piece of jade, on the other hand, is unique, and putting a price on it is a very complicated and subjective process. Jade mined in Myanmar is composed of the mineral jadeite. It can be found in stones that vary in size, from pebble-small to boulders taller than a person. Every stone has distinct hues and patterns. In addition, it is very hard to tell the exact quality of an uncut stone – its internal structure is also a determinant to its quality. Imperial jade is the most valuable and is made into high-end jewelry. Commercial jade is usually made into carvings and bangles and is of medium quality. Utility jade is the lowest grade, and is used for tilings and carvings, as well as cheap jewelry. Note these three categories are not comprehensive; there are many subcategories. For instance, utility jade is classified into A, B, C and D grades. There is a great deal of variation in quality within imperial jade and commercial as well. Ideally, we want to determine out of the total quantity of jade produced, what percentage of that figure is imperial, commercial and utility jade. In 2016, the same research group published another study based on industry interviews, where imperial jade accounted for merely 0.01 percent of production. The first of these percentage estimates were used in Global Witness' estimates, as Harvard/Proximity's 2016 study had not come out yet. In conjunction with this estimate, Global Witness derived another set of percentages from the jade sold at the official emporiums. We will now look at how percentages were derived from emporium data, and what actually goes on at an emporium. How is jade officially sold? Every year, one or two large gems emporiums are held in Naypyidaw, Myanmar's capital. They are organized by MGE, a state-owned enterprise responsible for regulating the jade and gemstones sector and production of jade and gemstones through joint venture agreements with private companies. Foreigners are prohibited by law from operating in the sector. The major jade mining regions are also off limits to foreigners. The emporiums are therefore the only official channel where international buyers can purchase Myanmar jade and gemstones. The vast majority of foreign buyers come from China. During an emporium, jade and gemstones are grouped into lots and auctioned over the course of several days. Auction winners must deposit 5 percent of the price of the lot and are given 90 days to claim the lot they successfully bid on. Global Witness' 2015 report consolidated data from industry sources about the quantity of jade that was sold in emporiums from 2005 to 2014. After the end of each emporium, an official press statement is released announcing the quantity and value of jade sold at the auctions. What is important to note is that this data shows the total amount that was bid by buyers. This means the buyer has paid the 5 percent deposit for the lot but may or may not have paid the remaining sum in order to complete the purchase of the jade. MGE has provided us with additional detailed data showing how much of the jade was actually fully paid for during the 90-day period. It turns out that the amount of jade that is fully paid for and redeemed can be significantly less than the amount initially auctioned. We have data for the amounts that were fully paid for and redeemed for emporiums from 2011 to 2016. The graph below shows the two different quantities from 2011 to 2014, the years for which we have data for both auctioned and redeemed amounts. We now have another estimate from the data provided by MGE for the jade that was actually paid for and redeemed. 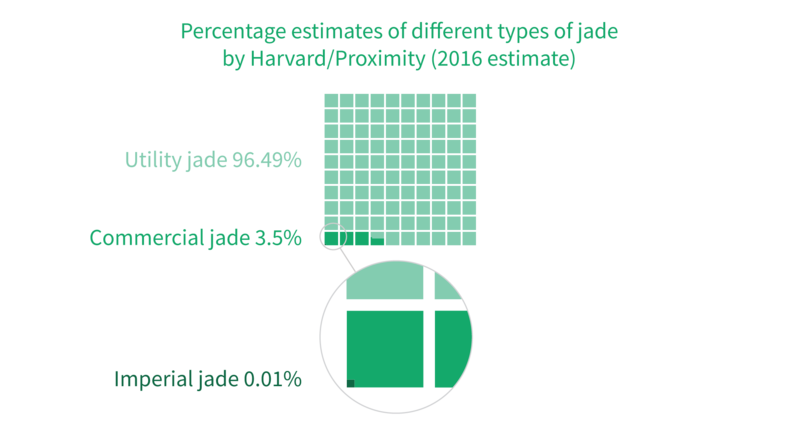 In this estimate, the percentage of imperial jade is only 0.005 percent, much closer to the 2016 Harvard/Proximity study's estimate. There seems to be quite a bit of imperial jade that was not redeemed after the auction. Four very different estimates of the percentage splits underscore the uncertainty of establishing the sector's value. 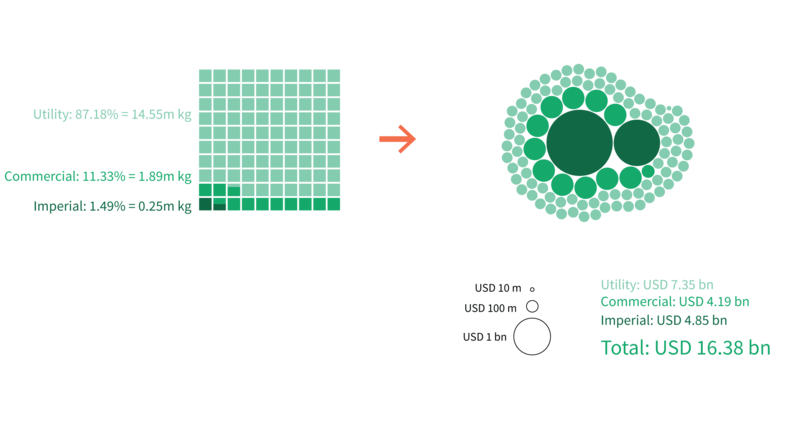 The percentage split of the different types of jade is not the only source of uncertainty. There is also deep uncertainty in price estimation. 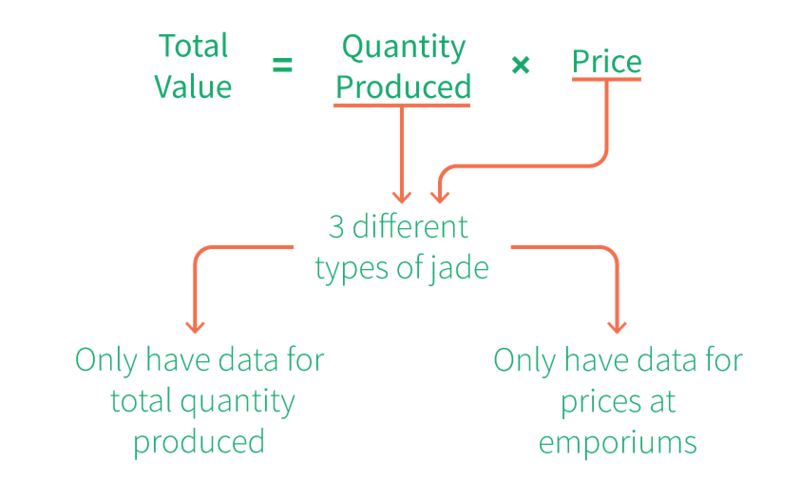 Fortunately, we can also use emporium data to estimate the average price of each category of jade auctioned and sold. 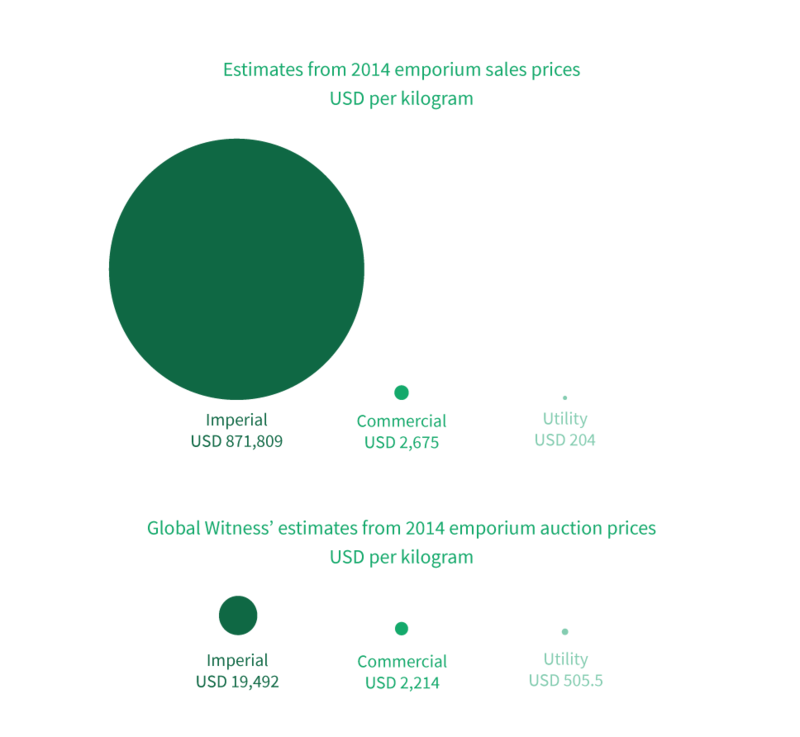 Global Witness used the data for auctions from the 2014 emporium to estimate the average auctioned price per kilogram of each of the types of jade. Whereas they only had access to one year's worth of auction data, MGE has provided us with data for multiple years of actual sales of jade that were fully redeemed after the auctions. From this data, we can also calculate the average price per kilogram of each of the types of jade. The chart below compares the Global Witness estimates with our estimates that use the latest data from MGE. To recap, the following two tables show the emporium data we have used to help us estimate the total value of Myanmar's jade industry. Now we are ready to dive into the actual estimates. Let's go back to our formula for calculating the total value and update it with how we might be able to get estimates for quantities and prices. Although we do not have price and quantity data broken down by type of jade for the entire sector, we can come up with estimates for volumes of each type of jade using data from emporiums, as well as information from industry experts. 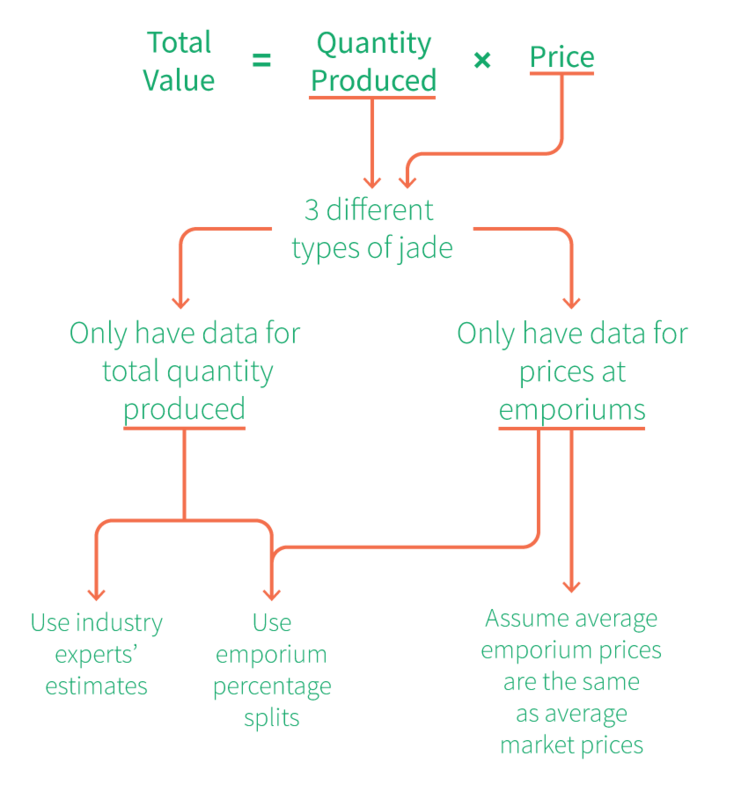 We can also use average prices of each type of jade from emporium data to assume that the overall jade market has the same price structure. Let's see how we can use these quantity and price estimates to calculate the total value. For example, suppose we have 1 kilogram of imperial jade valued at USD 20,000 per kilogram, 5 kilograms of commercial jade valued at USD 2,000 per kilogram, and 20 kilograms of utility jade valued at USD 200 per kilogram. The Myanmar's Central Statistical Organization's official figures indicate a total of 16,684,386 kilograms of jade was produced in fiscal year 2014. First, we will try to re-calculate Global Witness' estimates, using both the 2013 Harvard/Proximity percentage split and their 2014 emporium auctions percentage split..
and 60 percent utility jade = 10,010,632 kilograms, valued at USD 505.52 per kilogram. and 87.18 percent utility jade = 84,342,908 kilograms, valued at USD 505.52 per kilogram. These two estimates, USD 34.2 billion and USD 16.4 billion, are not far off from Global Witness' estimates. Their calculations yielded USD 34.25 billion and USD 15.45 billion for the emporium percentage split and the Harvard/Proximity percentage split respectively. 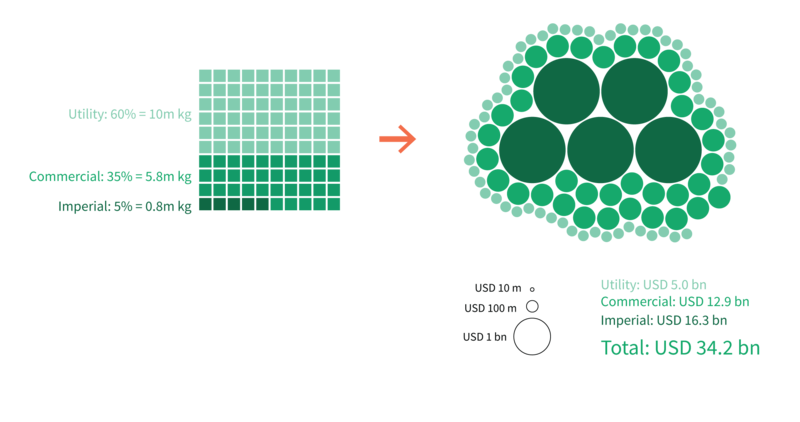 The Global Witness report then incorporates more sales data from another local jade fair that was organized in 2014, and applies the Harvard/Proximity 2013 percentage split again to this expanded dataset to arrive at what Global Witness considered to be the most accurate estimate for the value of the jade sector, which was USD 31 billion. Can we get better estimates with new data? It has been about three years since Global Witness' report was published. We now have new data from industry experts and official details about emporiums from MGE. Following the same method that Global Witness used, is it possible to determine if the new data produces a better estimate of the value of jade for 2014, when prices spiked? and 96.49 percent utility jade = 16,098,764 kilograms, valued at USD 203.55 per kilogram. and 93.94056 percent utility jade = 15,673,406 kilograms, valued at USD 203.55 per kilogram. Compared to Global Witness' two initial estimates of USD 34.25 billion and USD 15.45 billion, our two values USD 6.3 billion and USD 6.6 billion, have a much narrower gap. They are however, about two to five times smaller than Global Witness' estimates. There are two other points of comparison to make. The first is the value of jade imports to China in 2014, which stands at USD 12.8 billion. The Global Witness report takes this as the lower bound for the value of the jade sector in 2014. It could be the case, however, that jade produced in one year might be exported in another year. Given that prices were increasing up to 2014, exporters might have been selling stockpiles from previous years. Secondly, when Global Witness calculated its USD 31 billion final figure using the expanded data from the local jade fair, they actually obtained two values. One was USD 31 billion, which it got from applying the Harvard/Proximity 2013 percentages, and another was USD 5.64 billion, obtained when applying the percentage split from the 2014 emporium auction data. This figure, which Global Witness dismissed as impossible because it was below their lower bound of USD 12.8 billion, is actually much closer to our own estimates. We are still barely scratching the surface when it comes to actually figuring out what the real value of Myanmar's jade is. But with more data made available through transparency initiatives, we may get closer to the true figure in the near future. In the meantime, we can only come up with estimates for the value of Myanmar's jade industry that are contingent on a lot of assumptions. Using the interactive tool below, you can test out your own assumptions to observe how the valuations change. Written by Yan Naung Oak. This article reflects his opinions, and does not represent the views or work of the Natural Resource Governance Institute.